According to NASA, one of Saturn’s moons named Enceladus may harbor a hidden ocean containing alien life. For those people living in the Northern Hemisphere, August is the month to enjoy the Perseid Meteor Shower. However, this year many skywatchers will be facing a mean adversary in their attempt to see this annual spectacle: the bright presence of the Moon. But don’t fret, there’s still some windows of opportunity for you to catch a few shooting stars. European Space Agency’s (ESA) Rosseta spacecraft arrived at Comet Churyumov-Gerasimenko Wednesday after a 10 year flight to catch up with the comet. This image of Comet 67P/Churyumov-Gerasimenko was taken by Rosetta’s OSIRIS narrow-angle camera on 3 August from a distance of 285 km. The image resolution is 5.3 metres/pixel. Watch the press conference at ESA on Wednesday for the latest in images and how scientists are going to proceed now that Rosseta has reached the comet. Stunning close up detail focusing on a smooth region on the ‘base’ of the ‘body’ section of comet 67P/Churyumov-Gerasimenko. 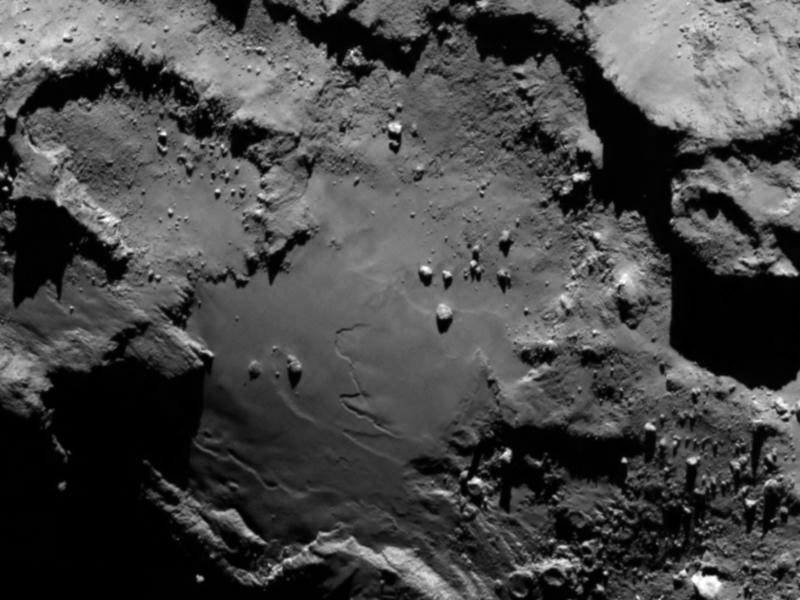 The image was taken by Rosetta’s OSIRIS narrow-angle camera and downloaded, 6 August. 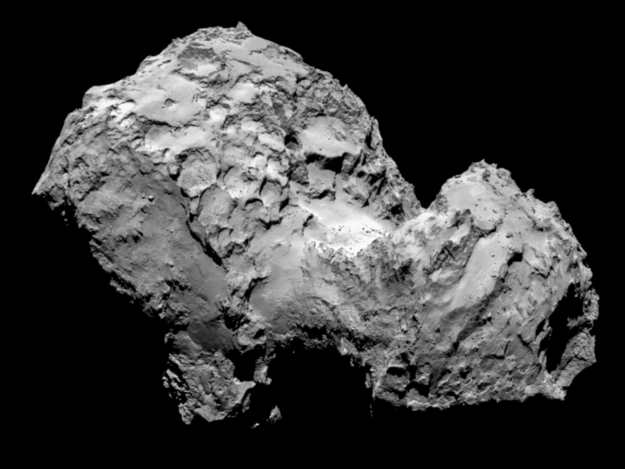 The image clearly shows a range of features, including boulders, craters and steep cliffs. The image was taken from a distance of 130 km and the image resolution is 2.4 metres per pixel. There will be some amazing science done in the next 2 years by the team at ESA. Recently, at a press conference at a meeting of the American Astronomical Society, Gongjie Li of the Harvard-Smithsonian Center for Astrophysics predicted the death of two exoplanets. “As far as we know, this is the first time two known exoplanets in a single system have a predicted ‘time of death,'” she said. The two planets she’s talking about, Kepler-56b and Kepler-56c, are predicted to be swallowed by their star in 130 million and 155 million years, respectively.